Not the best thing you've eaten in your life, or even in the past ten years, but lately, as in the last month or two. Me, it's chickpea gnocchi with venison ragu and nicoise olives, a recent special at Avec. Lightly scented with rosemary, meltingly tender venison, gnocchi that were concurrently feathery light and chewy, poetry on a plate. Strawberries and Cream at Vie in Western Springs. I have been braying about the "tyranny of the fresh", and then exhibit A fell into my dish. Vie puts ultra perfect farmer's market berries into a can, expertly preserved, and then when the rest of the area is suffering from potato-berries, serves them. The intensity of flavor proves a properly preserved product more than holds its own against fresh. The ice cream: made from local Oak Grove dairy cream. The pastry chef at Vie told me how expensive the Oak Grove cream was, $40 was the number, I forgot for how much. He had to use it sparingly. I am very glad I found the dish he used it. Edit to correct the name of the dairy. Oak Grove milk, BTW, can be found at Fox and Obel. Last edited by Vital Information on May 4th, 2006, 7:33 am, edited 1 time in total. Actually, the gnocchi from avec is also the best thing I've eaten lately. Small Italian beef with hot peppers at Al's on Taylor. I have to confess that this was my first Italian beef ever, so I really have nothing to compare it to. But it was magnificent. Sturgeon sandwich at Barney Greengrass....AKA the Sturgeon King. Last edited by PIGMON on May 4th, 2006, 8:00 am, edited 1 time in total. 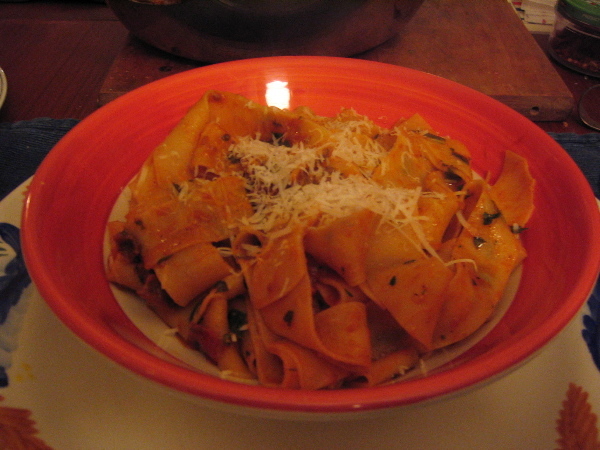 1) Tagliatelle bolognese at Terragusto. 2) I never go to Hooters on my own accord, but for a recent bachelor party my presence was required. I think I mowed through a couple dozen hot wings in record time. They were fantastic, and I'm not embarassed to say so. My brother-in-law asked if "anyone was going to revoke my foodie membership card if they knew I was enjoying Hooters food." I replied, "If they do, I think I need to buy them a plate of these wings." Suadero at Arandas on the 47th-a-Thon, my taleggio and truffle oil pizza, also the tagliatelle bolognese at Terragusto, sparerib at Black's, and trilobite. Monday night I took the Paulina Market NY strip in my fridge, cranked up the high-power burner under the cast-iron, waited for the smoke, cooked it 3 minutes 45 seconds on the first side and 3:15 on the second, had the best steak I've had in a long time. And the cupcakes at M. Henry. As I noted in the Andersonville bakeries thread, I'm not a cupcake enthusiast, but... wow. Best bouillabaise in a lonnnnnggg time. Friday, April 28, 2006. Aprx. 8:30 p.m. The quail egg ravioli at Schwa. Warm, gooey decadence. Yum. Last night's chocolate pecan pie at Fonda del Mar. Man was that good. I rarely swoon over dessert, but the buttery crispness of the house-made crust and the nutella-like texture of the filling really did it for me. Mmm. Still taste it. The tuna fish "sandwich" at Number One Dumpling in Chinatown in NYC. A light mixture of tuna, cilantro, peas(! ), and mayo in a freshly made xiao bing (chinese sesame bread). Comfort food at it's best, even when eaten standing up in the corner of a busy takeout joint. (Plus the company was good, too. The spicy pork BBQ at Chicago Kalbi! As of ten minutes ago, fresh bread from D'Amato's #1 with a drizzle of manteca pura de Carniceria Leon. 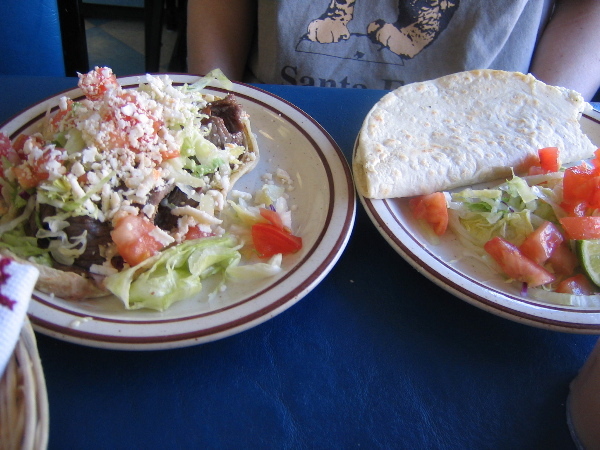 (Leon's fresh lard is essentially carnitas, hold the meat.) And a slice of the cherry bar from D'Amato's. Sweet baby Jesus, I can only eat that once in a while. And the ideal, anticipated stuff I have not yet had at Alinea tonight. It was a total spur of the moment surprise, Snow Crab legs at the Half-Shell. A friend and I were returning from watching the Cubbies stink up Wrigley, and we stopped in there "for old times sake" (neither of us had been there in over 20 years). Of course, we were both pretty lit after stopping at Jake's for some high ABV belgians, so our judgement may have been clouded. But, boy were those legs tasty, sweet and juicy and tender. The soft shell crabs were pretty darn good too. BTW, absolutely nothing had changed at the place. Talk about a time-warp. I've developed an affinity for the simple in the past few weeks. The "regular" chicken salad from te Treasure Island deli is a thing of beauty like your grandmother (though not mine) used to make. Big chunks of real chicken, thin cut slices of celery dressed just right in a slight mayonaisy tasting dressing. Simultaneously my mouth started watering and my heart muscles constricted. JeffB wrote: And a slice of the cherry bar from D'Amato's. Sweet baby Jesus, I can only eat that once in a while. I'm eating lunch across the street from D'Amato's, looks like a cherry bar is in my future. Looking forward to hearing about Alinea. 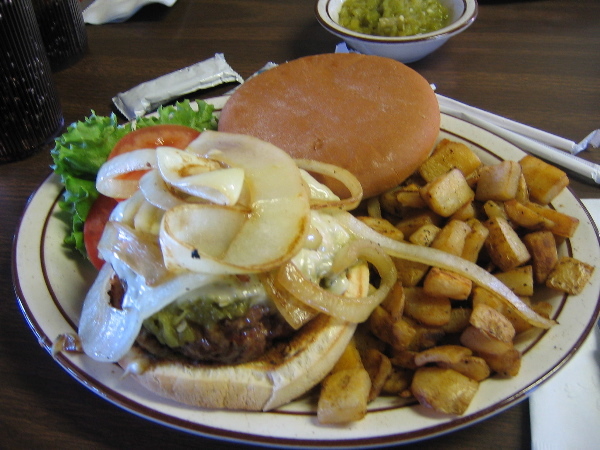 A green chile burger at Bobcat Bite, Santa Fe, N.M.
Shrimp dumplings with spicy peanut sauce, from Peking Chinese Restaurant, Parsippany, NJ. One of the few things that can brighten up my day while stuck out here in Jersey: large pieces of shrimp in purses, in a gingery peanut sauce. Looks gloppy, tastes great. So, in Chicago restaurants, recently? OR perhaps the selection of mezes Antonius and I had at Venus on Jackson, especially the saganaki halloumi and the octapodi sti shara. No picture, sorry – we forgot to bring the camera. Last edited by Amata on May 4th, 2006, 12:08 pm, edited 1 time in total. NY Strip at Mas last Saturday. According to the menu "new york strip, cabrales butter, tobacco onions, chipotle mash"
It may have been the best steak I ever had - including the big steak houses in town. These pork chops were the best meal I've had recently. and resulted in this delicious plated pork chop, sauteed green beans, and cucumber salad. Last edited by Bruce on May 4th, 2006, 4:42 pm, edited 1 time in total. That reminds me, based on Amata's description of the aforementioned licuado de mamey, I tried a mamey licuado for the first time last week at Cuetzala Gro. in Rogers Park. Wow, it blew me away. Mamey has now officially replaced Mango as my favorite licuado variety. Thanks, Amata. I guess this actually falls into "the best (non-alchoholic) thing you have drank lately" category. Cheese Fritters delivered from Philly's Best. How to describe these? First, the crust, which is perfectly golden brown, rough textured and just the right thickness and crispiness to give a perfect "bite" before you plunge into the center. Second, the body, which comprises a light, perfect yeast donut (from what I could tell) into which is woven just the right amount of cheese -- enough to be distinctly flavorful, not so much as to dominate the texture and turn this into a gooey fried cheesestick. Third, they are drizzled in garlic butter -- just a touch, but enough to get the idea across clearly. The fritters are accompanied by tomato sauce, which is unremarkable but decently seasoned (not strictly necessary, but a good option for dipping). Six of these guys lasted about 10 minutes between me and Mrs. JiLS last night, and would be a meal in themselves. Wish I had thought to take a picture. I tried a mamey licuado for the first time last week at Cuetzala Gro. in Rogers Park. Wow, it blew me away. that's great! I'm really glad you tried the mamey, and thanks for reporting back. Corned beef and pastraimi at Jake's last Saturday. Sorry, Mrs. CSD couldn't wait for either picture before sampling her half. chicagostyledog wrote: Corned beef and pastraimi at Jake's last Saturday. Of all the delicious items mentioned and photographed in this thread, this is the one that has me re-arranging my weekend schedule to head to Milwaukee.